The Master Naturalist program provides opportunities for adult volunteers to learn about their state's natural history, environment, and conservation issues. Master Naturalist programs promote nature-based community service by citizen volunteers and provide continuing education opportunities. Over 45 states, including Illinois, have Master Naturalist programs. The East-Central Illinois Master Naturalist (ECIMN) Program, established in 2005, is coordinated by University of Illinois Extension serving Champaign, Ford, Iroquois, and Vermilion Counties. This local chapter is sponsored by Champaign County Forest Preserve District, Urbana Park District, and Champaign Park District. Our current team of 140 Master Naturalists have contributed over 14,000 hours of service valued at about $300,000 to Central Illinois in 2018 alone. Any adult can join ECIMN and become a Master Naturalist. It does not require a degree or years of experience. You do, however, need to complete the education and volunteer requirements and have a desire to positively impact your community. Read on to learn more about becoming a Master Naturalist in East-Central Illinois! 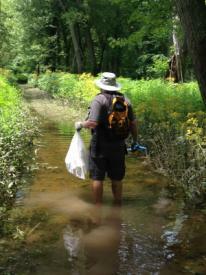 Click to Here to follow East Central Illinois Master Naturalist on Facebook.